The story of West Highland is very similar to Highland (notice no “s”, according to the official list of Denver neighborhoods.) Like its eastern neighbor Highland, West Highland formed out of the desire for folks to get out of the smokey bottom lands of Denver and find cleaner air. So it’s no wonder the neighborhood is filled with turn-of-the century Victorians, a few TB sanitariums, and smaller homes that filled in where the larger homes gave way. Also “out in West Highland”, rose the famous Elitch’s Zoological Gardens. Run by Mary Elitch, the first female zookeeper, botanic gardener, and theatre owner in the US, this once a booming entertainment complex with live shows, amusements, carousels, and concerts, its theatre and famous labyrinth remain. Sadly the gardens are gone, but the amusements and rides are now in the Central Platte Valley, also known as LoDo (Denver.) 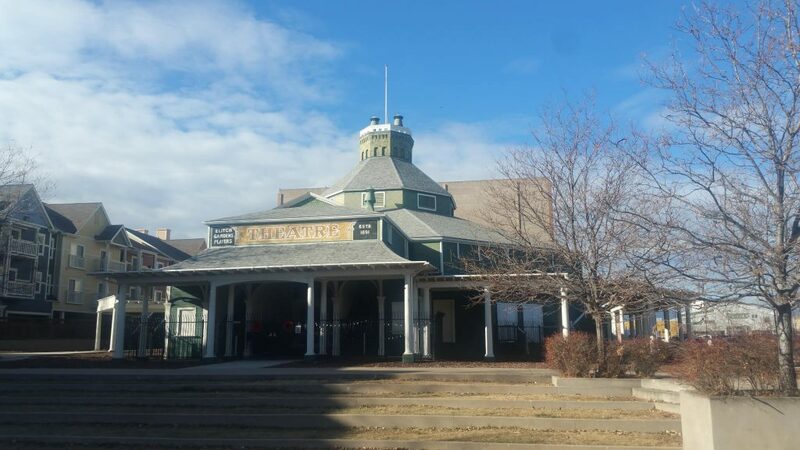 The Elitch Gardens Theatre Foundation now owns and runs the current venue. While walking the neighborhood, be sure to pass through what the locals hope is a future Packard Historic District between Lowell and the alley between Perry and Osceola, 32nd and 35th. This area is where many famous women used to live, including Antoinette Perry, namesake of the “Tony Awards”. 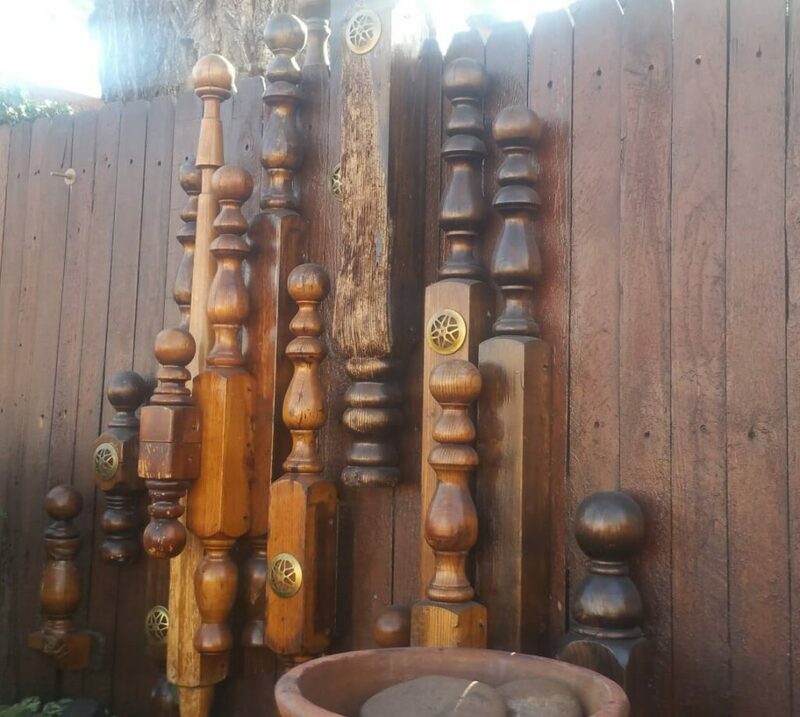 You’ll find some treats along this walk, including a bedpost art display, hanging tapestries, and fanciful painted homes. It’s 3 miles of historic fun. 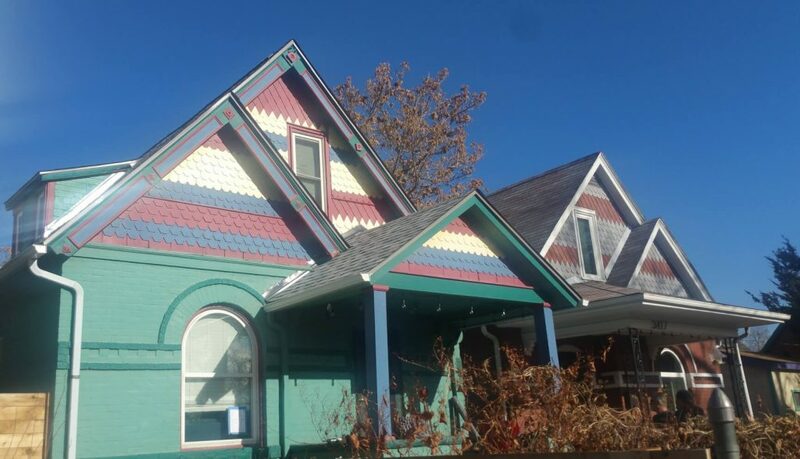 Buy my ebook that has all the 78 neighborhoods and their interactive maps, Walking Denver’s 78 Neighborhoods. Start at 3271 Wolff St. Walk north to W 36th Ave, take a right. At Vrain St, take a left and walk up through the playground. Pass by the old lady in a shoe piece on the playground, making your way to the Sprouts parking lot. At the parking lot, turn right and see the large green building on your right. This is the old Elitch Theatre. Continue walking to the west and see the old pavilion where the carousel once was. If it’s empty, go in and walk the labyrinth while also reading the instructions for enjoying it written on the wall. Exit onto W 37 Ave. Walk easterly to Quitman St, take a right. Take a left on W 35th Ave. At the alley between Perry and Osceola, turn right. 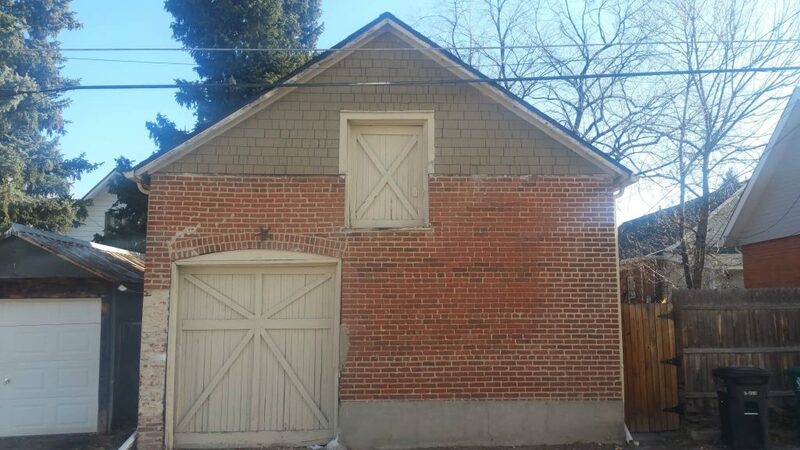 Enjoy the historic and restored garages in the alley. At W 33rd Ave, turn left. Cross Irving St and walk southeasterly along W Fair View Place to Highland Park. Walk a few steps along Grove St at the park then take a right on Green Court. Cross Speer on to W 32nd. Enjoy the shops on W 32nd, keeping your eye out for the Ford House, which is west of Lowell Boulevard, between Osceloa and Newton streets. It is the home of the famous female physician, Mary Ford and her partner, Helene Byington — whose daughter, Spring Byington, was a Hollywood actress from 1930 to 1960. Take a right on Perry St and then a left on W 33rd. At Wolff St, take a left, returning you back to the start. What did you like best about this walk?